I recently watched the live streaming session “Microsoft Business Forward” featuring Satya Nadella, James Phillis and a few others. They discussed some interesting concepts around understanding and satisfying customer needs, simplifying your operations and streamlining your processes, growing loyalty with your customers, and how to find the right customers and close deals faster. Satya discussed the vision of having all products come together, to have all data itself become a connected graph, instead of having silos of information. To accomplish this, there is a need for an extensible model. If the products are all separate, such as ERP and CRM, there is the challenge to compose a product on top of it. Microsoft is working towards a solution by creating one data model and the architecture to build upon it. This provides the framework for Partners and ISVs, such as ourselves, to build apps to make it a complete solution for a specific business. James Phillips from the Business Intelligence Platform spoke about digital transformation and stressed that business processes need to transform. I agree that it’s not only about the software, but about the data as well. So what does this mean for customers? Microsoft has de-segregated Dynamics 365, now allowing the customer to pick and choose what is needed for their industry. Customers no longer need to buy an entire suite of products that they may not use. 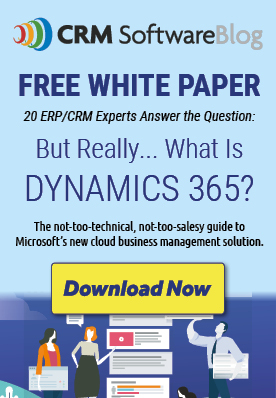 The magic of Dynamics 365 is the data, and having the Common Data Model to pull that data into multiple products that businesses use such as Office 365 or LinkedIn, integrating it all together. How we engage with each other has certainly changed, and during this transformation journey we may want to consider using relationship selling to deepen the experience with the customer. They showcased products such as LinkedIn Sales Navigator to make connections with customers alleviating cold call selling. With social media giving customers information about brands and products, this can spark warm leads coming in making it much easier for a sales team to sit down with someone that is already engaged and interested in a product. Empowering sellers is the best way to find the right customers and drive the bottom line of your company. Lastly, one comment resonated with me: no two digital transformations are alike. We know this from first-hand experience! So leverage the tools available, get to know your customers, and try to create the best experience possible. After all, it’s about the customers and providing the best experience for them. Written by Sheila Ochoa, Sales Lead for Rockton Software, application provider for Microsoft Dynamics 365. Where’s the Leads! Why Salespeople Hate CRM and How to Make Them Happy.